Students at Tokyo's University of Science have developed a new version of their muscle suit, a wearable robotic suit that assists the muscles when carrying out strenuous tasks. 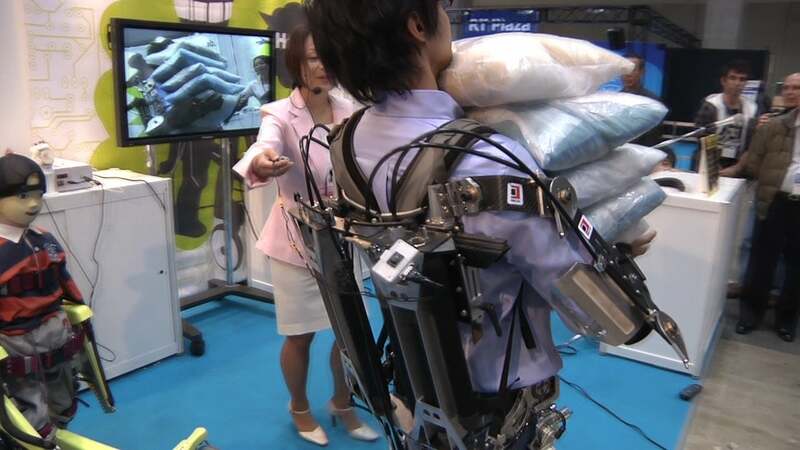 The original version of the suit, which has been in production for several years, provides assistance to the arms and back but the new version provides assistance to the back only. That means it is lighter and more compact than the original model. In a demonstration on Wednesday at the International Robot Exhibition in Tokyo, a student wearing the suit was able to bend down and lift 15 kilograms of weights with the assistance of the robotic suit. Doing so without assistance would be difficult for many people and could cause injury to some. The university is still developing the suit and the model demonstrated on Wednesday was the first prototype. A production version is due some time in 2010. With its greater assistance the original version of the suit will remain the most useful for heavier tasks. In a demonstration of that model on Wednesday a student was asked to carry 10-kilogram bags of rice. With the suit switched off he could manage up to three bags before they started to get too heavy to carry, but with the suit switched on another two bags could be loaded into his arms. He quickly dropped the bags when the suit was switched off as without assistance it was too much weight to carry. Such suits are being developed with an eye on assisting the physically challenged and workers carrying out physically demanding jobs. Earlier this year Toyota Motor unveiled similar robot-assisted suits and has been testing them at factories in Japan with workers who have to lift large or heavy sheets of metal or car parts.